Comedians Seth Rogen (Kung Fu Panda, Monsters vs. Aliens) and Billy Eichner (Billy on the Street, Parks and Recreation) are currently in talks to play Timon and Pumbaa in the Disney live-action adaptation of The Lion King, according to a report by Variety. 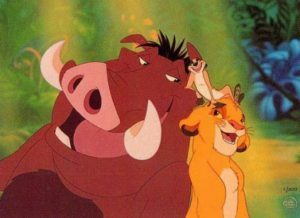 In the original animated film, Timon and Pumbaa are the meerkat and warthog who take care of young lion cub, Simba, after his exile. They then become his lifelong friends. As previously reported, Donald Glover will be voicing Simba and James Earl Jones will be reprising his role as Simba’s father, Mufasa. Beyoncé is said to be in talks to voice the role of Nala. Jon Favreau (The Jungle Book) will be directing and Jeff Nathanson (Pirates of the Caribbean: Dead Men Tell No Tales) will be writing the script. The Lion King was first released in 1994 and is one of the highest-grossing animated films of all time. It is also just one of the many animated Disney classic films that is being adapted into a live-action version, following the successes of Beauty and the Beast, The Jungle Book, Pete’s Dragon, Maleficent, Cinderella, and Alice in Wonderland. More adaptations are currently being developed including a live-action Mulan, a sequel to Mary Poppins, and a live-action version of The Little Mermaid. The Lion King is due to be released on July 19, 2019.